Recently I wrote this blog post about biking to save cars. It made me think about bikes that go with cars. Enjoy and contribute your own pairing if you like. First is my old Superbe and this old MG Midget I saw at a car show. I muchly like both. Neither have been restored, both have awesome patina, both are good solid runnres, both are good old British classics. Sorry about the lousy pic of the Superbe, turns out I don't have a good one and there's now snow on the ground so there won't be for a while. The next pairing is this Surley Pugsley with this Jeep. Of course this could go with any off-road vehicle. It could be your ticket to safety if you get your truck mired too deeply in the muck. It could also be the way you continue your trip when the muck gets too much for even the jeep or if the track gets too narrow. The next pairing is all about cargo and maybe style. I get truck guys. I like trucks. Some guys just end up hauling stuff around with them and need a simple way to do so. Others tend to want to dress their ride up a bit as well. There's a simple elegance in utilitarian cargo haulers. These two bikes represent a big part of the biking world. A lot of people are setting up a good rugged simple bike to carry a lot of heavy stuff. The idea is lots of cargo, lots of reliability. That's the same reason people buy trucks. You can even dress one of these right up just like your truck. Throw it in the back and take it with you if you like. The truck is an old Wilys pickup. I think they're awesomely cool looking. It could be any pickup truck here though. Of course, on the other end of the spectrum there are those that want a vehicle that fits in their back pocket. 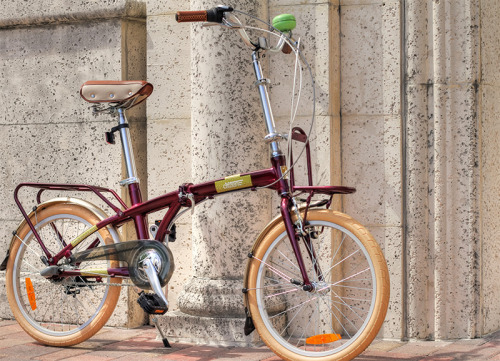 There are some pretty nifty folding bikes out there that go right along with the compact car philosophy. That's a Fiat 500, a current favorite of mine, and a very cool car in a very small package. Fold up your favorite folding bike and it'll come right along with you in the trunk. No problem. Probably one of the easiest pairings is with the carbon fibre crowd. For those who like the most technical of the technical, bikes can get as crazy as cars. This is a Trek Madone. Handbuilt, carbon fibre, yadda yadda yadda. Maybe these two aren't quite the equivalents but you get the idea. And for those who want a simple, fast, technical experience with as few frills as possible (as opposed to the previous pairing). For those people there's the fixie scene. Then there is this one which only requires a single picture. Hot rod and cruiser. Very cool. 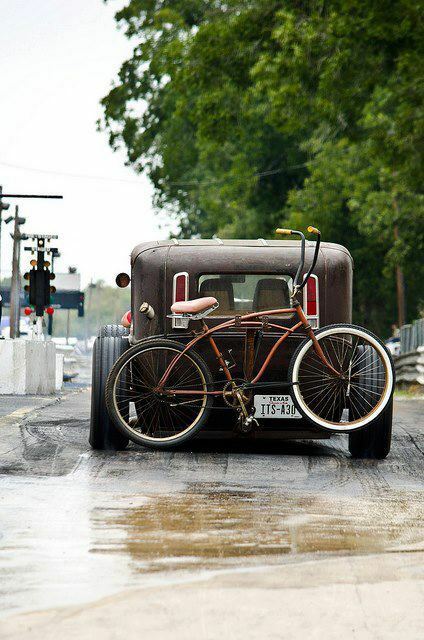 I suppose to be technical it's rat rod and cruiser. So as you can see, bikes and cars really can and do go together. Whether it's a case where you use your car for the longer distances and heavy lifting and then park it and take off on the bike for the short spur trips or a case where the bike further enables you to do what you're doing or whether the bike simply goes with the car, cars and bikes go together. Holy run-on sentence Batman. 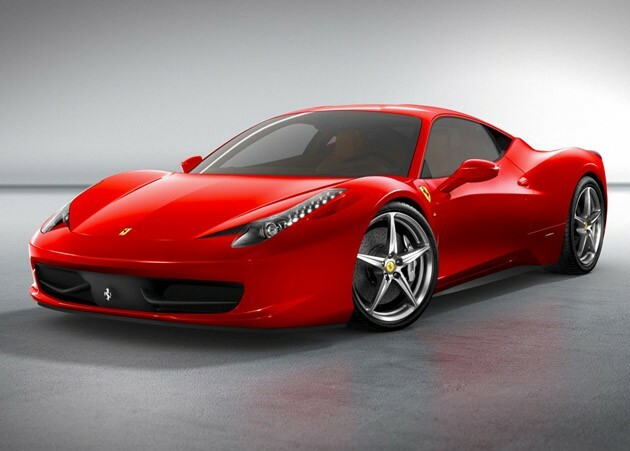 Anyway, if anyone is reading this let me know what cars and bikes you'd put together. You yadda yadda'd over the best part! Obscure Seinfeld references aside, are your pairings strictly for similarities? 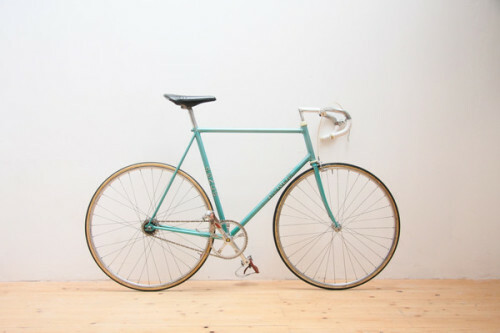 If I was pairing bikes/cars, I'd probably pair a hybrid/fixed gear bike and a truck. Truck for hauling and trips out to the country, hybrid/fixed gear for the city. More a complimentary pair than a similar pair. There's not really much rhyme or reason to it. I did do the city bike & truck one.